Put yourself in the position of a long trade fair day or week. You are constantly on the move, but at the same time you meet important customers or potential clients. Pure stress. The trick here is to remain calm and stay in control. The person in control is the one who has received a lot of business cards at the end and still finds them. Because contact with some people was in vain when the business card is missing. We therefore offer the solution with our elegant leather business card case. It is the perfect location for storing collected cards. At the same time, it creates a clear impression when the business cards folder is drawn to present your own card. You can only win with the elegant and simple leather design. Small talk is a very important element, especially when it comes to making new contacts, which should not be underestimated. Short small talk is recommended especially at the beginning and end of a conversation. But what is there to talk about when all the important business details have already been clarified? As a rule, business cards are exchanged at the end of a conversation. From now on you can start some small talk again. Whoever gets out a leather business card holder to exchange the cards has a good point of contact. It is even better if you have an individually embossed business card portfolio with engraving of initials or names. Was this even a gift from the woman or man? Then you can directly score points with a little personal small talk. Try it out! Small talk creates a lasting, authentic impression. 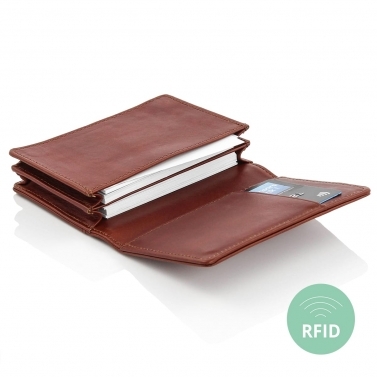 Business card cases with leather engraving are among the most popular business accessories today. Whether as a gift from the new boss or colleagues, for friends and business people or just for yourself: a good impression with business partners is guaranteed with a personalised business card holder. The whole thing becomes even more individual and personal if the business card case is engraved and thus has a personal touch. Whether business cards in a unique design, self-created or completely individual contact data: these data should be protected and stored securely. Especially in foreign cultures such as China, business cards are accepted, viewed and stored in a valuable way. This is a special kind of appreciation. We promise: a well-kept, elegant business card case will pay off sooner or later.